2015 is starting off cold, windy and rainy but things will start to look toasty and warm with my newest recipe. The January theme for #WeekdaySupper is A Lighter New Year and my recipe packs a lot of flavor and punch to wake up your weekday dinner. My Tomato Roasted Cauliflower Tagine turned out beautifully. What's a tagine, you ask? A tagine (pronounced tah-JEAN) is a conical dish, typically made of clay or enameled silicone, that is used to roast vegetables and meat in an oven. The shape of the dish facilitates self-basting. A tagine also refers to the actual meal cooked inside it as well. You don't own a tagine, you say? Me either. You are welcome to use a Dutch oven or other oven-safe covered dish. The results will be the same. I made this tagine for my mother and she couldn't get enough! It's definitely going into the Nik Snacks' Family rotation. I was inspired by a dish I had back in November at Le Cordon Bleu-Las Vegas during a Bleu Ribbon Kitchen demonstration. We were served cauliflower that had been sauteed in sesame oil, a fresh tomato sauce and chickpeas that were garnished with preserved lemon and olives. I really have an affinity for North and East African cuisine. Little Known Fact: I was a vegetarian through most of high school and college. Even now, I really dig the vegetables. Instead of a meat and three, I lean toward just the "three". I feel that vegetables have built-in flavor and you don't have to cook them or transform them much to enjoy them. Vegetarian meals don't have to be predictable and boring either. 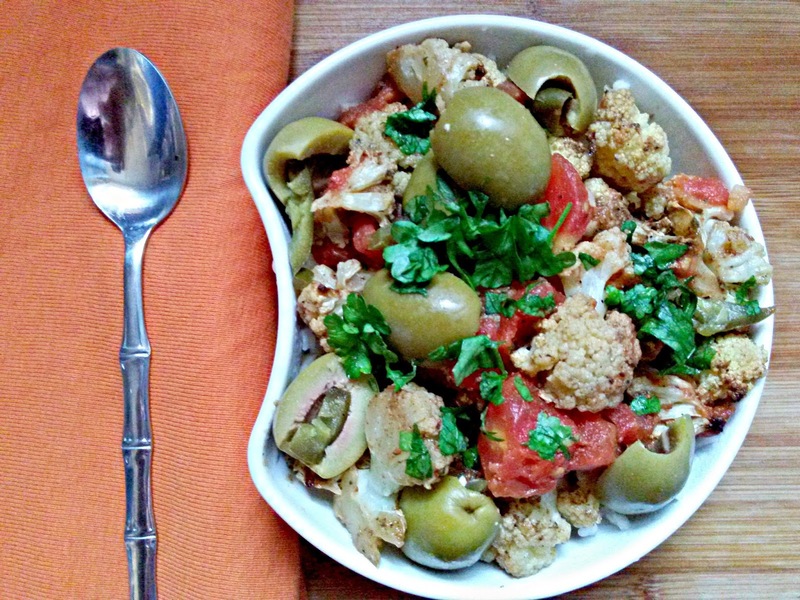 With this recipe, buttery cauliflower florets are tossed in a North African-inspired spice blend and kissed with plump, olives, tangy preserved lemon and chopped tomatoes. Served with couscous or rice and it's the perfect healthy weeknight meal. Add chickpeas or serve with quinoa to boost the protein and you'll have a balanced meal. Roasted in a Dutch oven or a traditional tagine, you'll have dinner on the table in no time at all. Adapted from Thomas Keller's Crispy Chicken Thighs from "Ad Hoc at Home"
½ bunch cilantro or parsley, leaves picked and stems discarded. Combine the spice mix spices in a large, dry sauté pan set over medium heat, and toast them gently until they become fragrant, about 1 minute. Add the cauliflower with the salt, pepper and the olive oil. Turn up the pan's heat to medium-high and saute the cauliflower until the florets are browned. Remove the cauliflower to a large Dutch oven or tagine pot. Reduce heat below the saute pan to medium, add tomato paste and deglaze the pan with the stock. Add the onion, garlic, ginger and saffron and stir to combine. 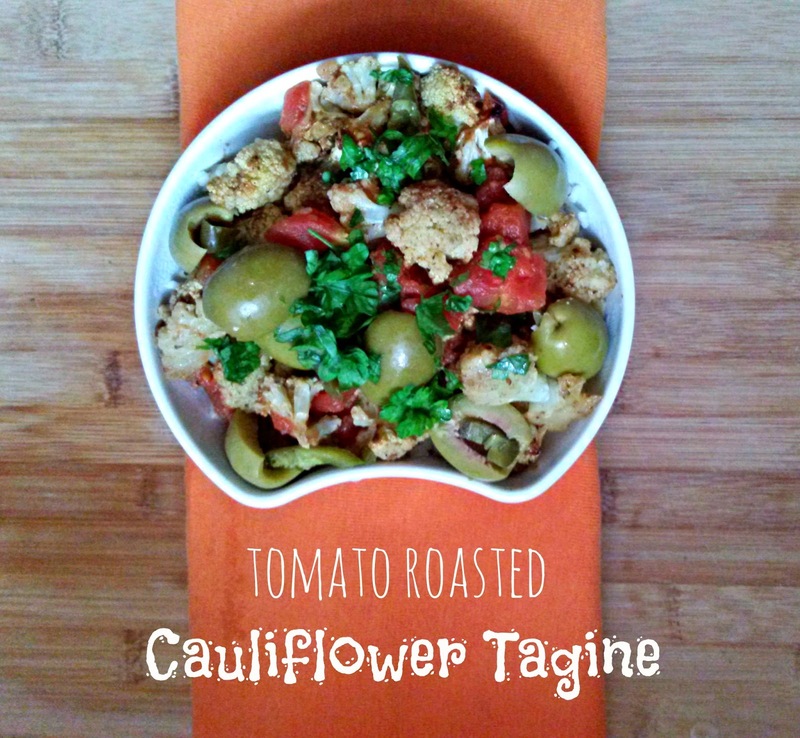 Pour the sauce over the cauliflower, stir in the tomatoes, preserved lemon and olives, cover the pot and transfer to oven to cook for 20 minutes. Serve the cauliflower garnished with the cilantro or parsley leaves, over couscous or rice. NOTE: Preserved lemon can be made at home, but it takes a month. Find a great recipe here. No time for preserved lemon? Use dried lemon peel, found in the spice aisle. 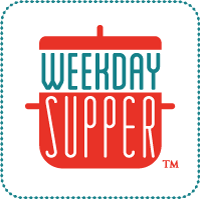 Try these great ideas for Weekday Supper from The Sunday Supper Group! Find more great ideas for Weekday Suppers on our Weekday Supper Pinterest Board ! Oh yum Nikki! I love all the flavors in this dish. This looks so hearty and soul warming which is sometimes tough to do w/out meat. Great recipe. Love that you added those awesome green olives, looks so good! This sounds so good, Nikki! I have all these spices on hand, I can try this real soon! I bet the wonderful spices make this so tasty! We would have quite a conversation about "tagine" at the dinner table! Out of all of the NUMEROUS kitchen gadgets, tools and cooking vessels - a tagine is one that we don't have! (I've got to get one!) This dish looks super healthy and delicious! The flavors in this spice blend sound fantastic - so much flavor in this dish! 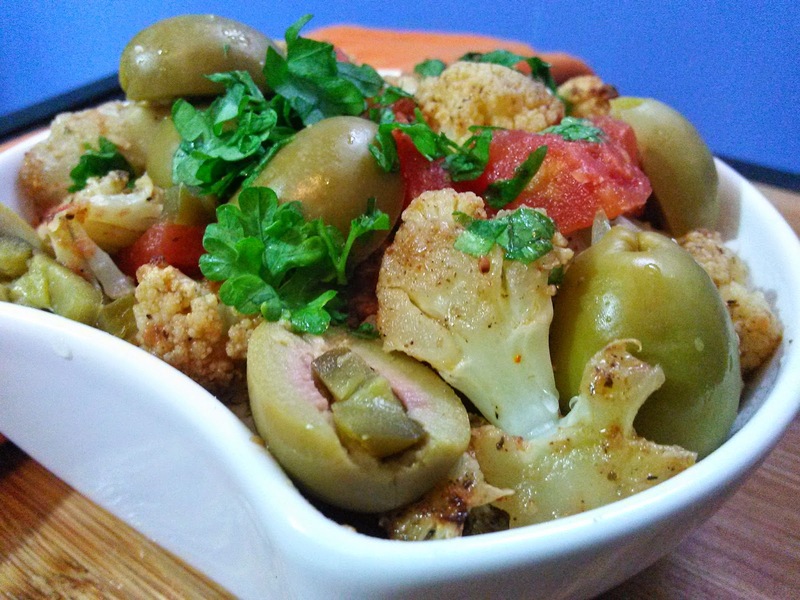 Oh man, those giant green olives are calling out my name, same with the cauliflower. I just love the look of this dish. I'm blown away by all the flavors and textures in this dish! Now that looks amazing! YUM!!! So many flavors coming together! I can easily make a meal out of vegetables too. I do a lot, but I need to make sure I get enough protein, so sometimes I add a couple soft boiled eggs or some wild fish. This looks really tasty! What?! We were supposed to prepare lighter #WeekdaySupper dishes this month? Oops! I guess it's too late for me, eh? So glad you made up for it and it looks like there's no sacrifice in flavor either. Yum! Sounds and looks delish and healthy. Looks like a yummy recipe - I love cauliflower! I don't normally like cauliflower but this looks and sounds amazing! I love cauliflower! This looks very yummy. Definitely trying it. I love trying new flavors and this looks delicious! Thanks for sharing the recipe. I may have to give it a try. Holy massive olives, batman!! Those things are huge! This tagine looks great. I'm on a major cauli. kick right now and you can never go wrong with olives and preserved lemon.